Cape Town - Benjamin Mendy recently spent time at a Dubai fitness camp and could now return to playing action this weekend against Fulham. The Manchester City and France left-back has been plagued by injuries and has made a total of just 24 appearances since his £50m arrival from Monaco in the summer of 2017. Mendy came on as a late substitute in the Carabao Cup win over Burton Albion back in January - following an earlier two month lay-off with a knee problem. The France World Cup winner also missed the majority of last season after suffering a cruciate knee ligament injury, which has only added to boss Pep Guardiola's frustration this time around. Mendy has used the recent international break to fine-tune his fitness and will be assessed in training ahead of the Saturday lunchtime kick-off at Craven Cottage. The best he can probably expect is a place on the bench against the relegation-threatened Cottagers, which would see the Citizens return to the Premier League summit with a victory, ahead of Liverpool hosting Tottenham Hotspur on Sunday. 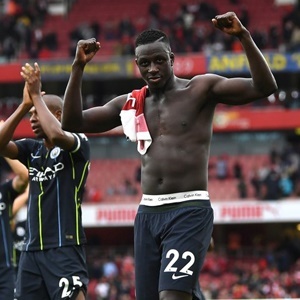 City remain in the hunt for a quadruple of trophies, however, so Mendy's availability once again will certainly boost towards those efforts at the Etihad.